Today I fasted for the climate. On the first of every month, thousands of people around the world choose not to eat in order to raise awareness of climate change and to demand our leaders take action this year. In a moving speech he said he would not eat until countries at the Warsaw conference delivered actions that would ‘stop the madness’ of the climate crisis. Hundreds of others from around the world chose to fast with him in solidarity. Why would a food blogger fast? I love to shop for food, cook food and of course, eat food. If you don’t like discussing food and food politics, you will find me incredibly annoying. When Annie, writer of the wonderful Kitchen-Counter-Culture food blog, recently wrote about her first Fast for the Climate and asked other food bloggers to join her, I jumped right on it. As food bloggers, I believe we have a wonderful opportunity to shine a spotlight on a more sustainable way to eat and live. The problem of climate change can leave me feeling helpless. But people are fed up. The People’s Climate March has invigorated the environmental movement. Hundreds of thousands of people marched two weeks ago and today, thousands of people joined in the fast. I found fasting difficult (I’m happy this long day has almost ended) but as I sat here alone at my desk working from home today (I kept my day low-key), I felt a solidarity with all the fasters out there and those already affected by climate change. I felt a connection. I allowed myself to drink tea without any milk (I never add sweetener). I don’t think I could have fasted all day without it. In the morning, I didn’t initially feel hungry, but I did feel anxious knowing I would not eat all day, even though I had chosen not to eat. I cannot fathom what my life would be like if I had no choice. Around 2pm I broke down and ate a little hunk of the sourdough bread I’ve been drying out to make kvass. It was hard as a rock, so I dunked it in my tea to soften it. Even then I had to chew slowly to avoid breaking a tooth and believe me I enjoyed every morsel. Surprisingly, that little hunk of bread satisfied me. 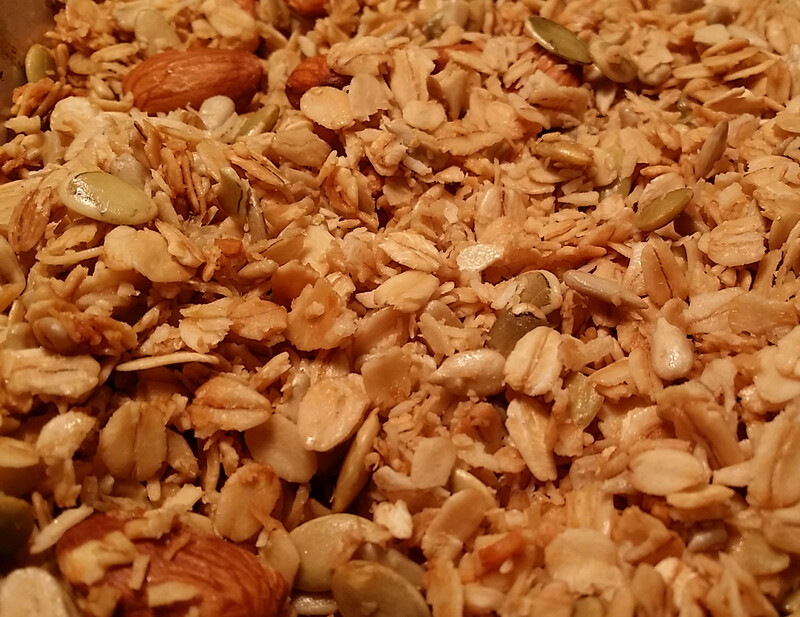 Later I made granola as we had eaten all of the previous batch. I did taste a few minuscule bits of it to test its crunch. It turned out really well this time—with raw honey to sweeten it and coconut oil to toast it—but knowing I had pledged to fast, I was able to resist it. Tomorrow morning, I’ll eat granola for breakfast. From a pile of apples in a hanging basket in the kitchen, I’ve already chosen the one I will eat when I wake up and I’ve set it on the bare kitchen counter. One of the best personal results to come from this fast is a heightened sense of appreciation, not just for food, but for abundance in general. Last week I quit my best-paying writing gig in order to pursue some more meaningful projects. I’ll have to scrape by for a little while but right now—hungry—I think everything will work out. I have granola in my kitchen. This is very interesting. It’s good for us to sit back and realize all of the excess in our lives. Thanks for bringing this to light! You’re welcome. Thank you for checking it out. It was a very eye-opening experience. My stomach was asking me all day what I was trying to prove. I did make it through 24 hours w/out eating. However I felt like a a jackass by the end of it, b/c I asked my husband to go out and get me some carrot cake from the super market. It came in plastic and was probably full of GMOs. Not my usual way of doing things. I jotted down little impressions as the day progressed. Just before noon, I wrote, “OMG this is useless. Is this going to make any difference? I want to go back to sleep. Ppl must think I’m insane, not eating for 24 hours. I want almonds.” But later in the day I felt better and grew very appreciative and grateful by the end of it. We have plastic/GMO-filled disasters occasionally too. It happens. You should be proud of yourself for completing the fast! I’m so glad you joined in. I found it easier knowing other people were fasting. Zero Waste Chef, you are so inspiring! What a wonderful post. Wow, I had no idea that we waste 40% of our food on average. Food is so incredibly expensive these days that I hate to waste anything. We have chickens, so every time I clean abandoned food out of my fridge, I feel a little better about it than I would if I were sending it to the landfill or even composting. Sorry, I thought I had responded to this…Yes, 40%! It makes you wonder how much people waste at the high end. Do they just steer their shopping carts directly to the grocery store parking lot dumpsters and toss everything? It would save a few trips to the curb at home. I bet the chickens are happy too when you clean out your fridge 🙂 I have been trying to cut down on my composting by using everything. Compost beats landfill, but it’s still waste. Thanks for the comment.